﻿ Grenada revolution history of Maurice Bishop. Grenada revolution history of Maurice Bishop. The history of the Cuban involvement during the Grenada revolution and Reagan's miltary invasion. Edward Gairy and Bernard Coard with the Grenada seventeen. Guides » History of Grenada – from Prehistory to the Grenada revolution and beyond. » The Grenada Revolution. Prologue of the Grenada revolution. Power changes on Grenada in short. 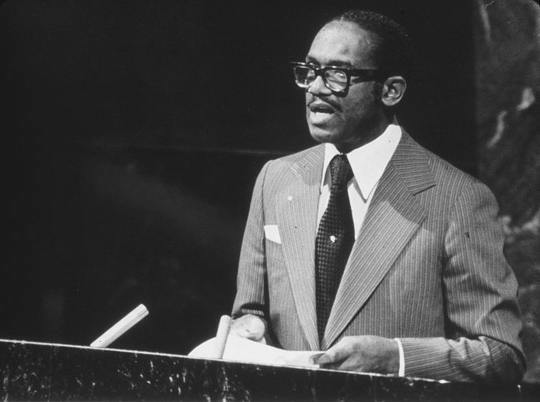 Sir Eric Gairy was Grenada’s first prime minister. Gairy governed the islands in a most unsatisfactory manner. The in protest arisen New Jewel Movement launched an armed takeover of the radio station, police barracks and various other key locations in Grenada. This happened while P.M. Gairy was on a trip outside the country. The takeover was conducted by the People’s Revolutionary Army (PRA), formed in secret within the NJM. The People’s Revolutionary Government (PRG) was proclaimed on 13 March 1979. 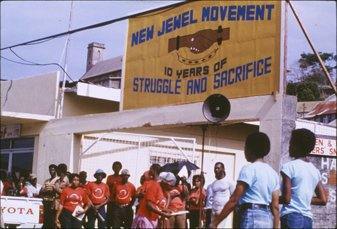 The New Jewel Movement overthrew the government of Grenada in this revolution on Grenada. In 1983 internal divisions occurred within the central committee of the PRG. A group led by Deputy Prime Minister Bernard Coard attempted to convince Bishop to enter into a power-sharing agreement with Coard. Eventually Coard placed Bishop under house arrest and took control of the PRG government. In 1984 a new government led by the NNP is installed on the islands. The Trial of coup leaders in August 1986. After obtaining independence, Grenada adopted a modified Westminster parliamentary system based on the British model. Why did the Grenada Revolution happen? It all began in 1973, when the New Jewel Movement was formed. As previously mentioned. motive for the formation was to oppose the dictatorship of Eric Gairy, successor to British colonial rule. Some say Gairy was treacherous and brutal as Papa Doc was in Haiti. Many activists, both in Grenada and worldwide, were inspired by the movement’s call for a populist socialism. During six years of growing mass mobilizations they created a virtual stalemate with the Gairy regime. The revolutionary forces launched an armed uprising on March 13, 1979. Within hours, government troops surrendered and the NJM was in power. Dramatic advances in poor people’s access to education and health care, land reform, and advances in women’s rights soon followed. The Grenada government was a system with a British appointed governor general. The governor was appointed by and representing the British monarch (head of state). In the case of Grenada the country was ruled by a prime minister who is both leader of the majority party and the head of government. The British head of state was hardly involved in the countries welfare. Sir Eric Gairy – Grenada. Eric Gairy headed the nation through the latter half of the 1970s. His rule was opposed by many in Grenada, who viewed him as a corrupt tyrant. In 1979, Gairy was ousted in a bloodless coup and the Marxist-Leninist People’s Revolutionary Government (PRG) came to power. 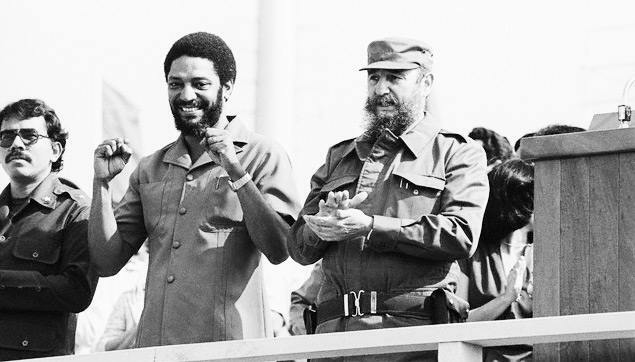 The New Jewel Movement was headed by the new Prime Minister Maurice Bishop. In 1969 Maurice Bishop returned to Grenada after studying law in England. Soon afterwards he helped form the Movement for Assemblies of the People (MAP) and the Movement for the Advance of Community (MACE). Bishop would later be executed in St. Georges. In a showdown at Fort George in the capital city of St. George’s, many Bishop supporters were massacred and Bishop was executed by a firing squad. Grenada under the lead of Maurice Bishop. 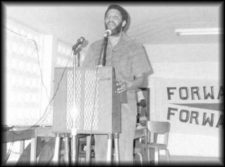 Maurice Bishop – Grenada Revolution. Under Bishop, Grenada aligned itself with Cuba and other Soviet block countries. This alarmed the U.S. and other Caribbean nations. In 1973 these organizations merged with Joint Endeavor for Welfare, Education and Liberation (JEWEL) to establish the New Jewel Movement (NJM). In 1979 a rumour began circulating that Gairy planned to use his “Mongoose Gang” to assassinate leaders of the New Jewel Movement while he was out of the country. In 1983, the PRG split and the faction opposed to Bishop had him arrested. On 13th March 1979, Maurice Bishop and the NJM took over the nation’s radio station. Ortega – Bishop – Castro. With the support of the people the New Jewel Movement was able to take control of the rest of the country. Maurice was strongly influenced by the ideas of Marxists such as Fidel Castro, Che Guevara and Daniel Ortega. Bishop began establishing Workers Councils in Grenada. Maurice Bishop Hunter College speech. Grenada is a particular threat as an English-speaking, Black revolution that could have a dangerous influence on Blacks in the U.S. Which indeed it did, and keeps on inspiring progressives worldwide. 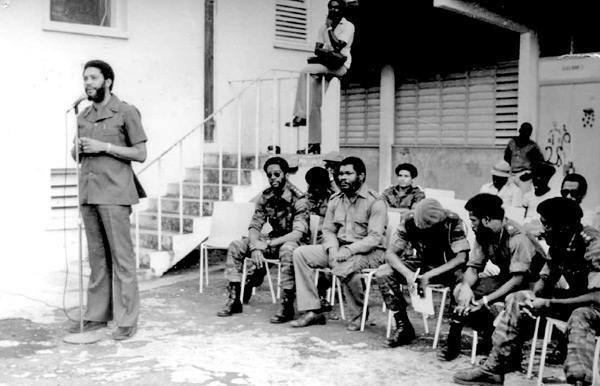 Maurice Bishop speeches at Hunters College Grenada. The video below is part of a documentary on 3 political figures who have transformed the island of Grenada. 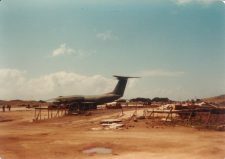 Russian aid to Grenada – Point Salines Airport construction. Bishop received aid from the Soviet Union and Cuba and with this money constructed a aircraft runway to improve tourism. He attempted to develop a good relationship with the United States and allowed private enterprise to continue on the island. Bernard Coard, the Minister of Finance, disagreed with this policy. He also disliked Bishop’s ideas on grassroots democracy. Probably the frictions in the NJP were fed by CIA aid to opposition factions. The inability of Grenada’s new leaders to resolve differences over governance led to the turmoil that opened the gates for the U.S. invasion. Bernard Coard, the finance and deputy prime minister, began waging factional warfare against Bishop and his allies. This culminated in the October 13 military coup. Bernard Coard commited the military coup of Grenada on October 13. On October 13, all the developing plans and dreams of the revolutionary government were smashed, provoked by a split within NJM ranks. Subsequently Coard overthrows the Bishop Government on 19 october. On 19th October, with the support of the army, Coard overthrew the government. Maurice Bishop and most of his ministers were arrested and executed. President Ronald Reagan, who had been highly critical of Bishop’s government, took this opportunity to intervene and sent in the United States Marines. US helicopters at Point Salines. The initial assault on 25th October, 1983, consisted of some 1,200 troops, and they were met by stiff resistance from the Grenadian army. Heavy fighting continued for several days, but as the invasion force grew to more than 7,000. The defenders either surrendered or fled into the mountains. Bishop and his closest confidants-including Rojas-were put under house arrest. Thus provoking massive popular protests led by high school students. Rojas was one of several officials who gained freedom amidst the chaos. Rojas remembered the events as follows. But the anti-revolutionary government forces violently stormed the fort. Maurice told me and a squadron of men to flee and inform the world of the repression. Moving quickly, we commandeered a bank of phones in the central telecommunications building nearby and began calling Grenada’s embassies abroad and international news agencies. From this location, we could also see the tragic drama unfolding. 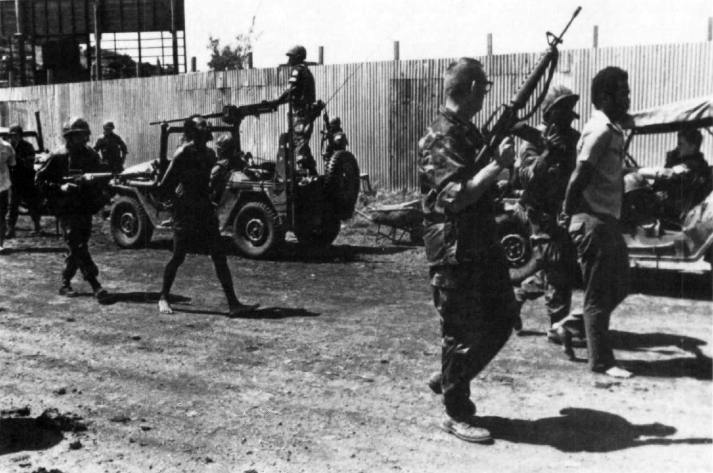 Pro-coup soldiers killed 13 of Bishop’s defenders, and minutes later murdered Bishop himself and several other cabinet ministers and union leaders. Rojas went underground, sought and was denied political asylum in Canada. He was repeatedly refused entry into the U.S..
As a result Rojas lectured and worked in Europe, Africa, and Latin America as a journalist and editor for several years before finally being admitted to the U.S. in 1990. The Grenadian Marxist-Leninist NJP Government had established close ties with Cuba, the Soviet Union, and other communist-bloc countries. 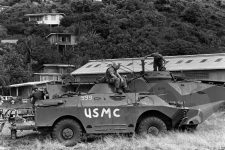 The American involvement on Grenada. The people of Grenada adored Bishop, but the Reagan administration viewed him as diabolically suspicious. Particularly for his close relationship with the Cuban government. 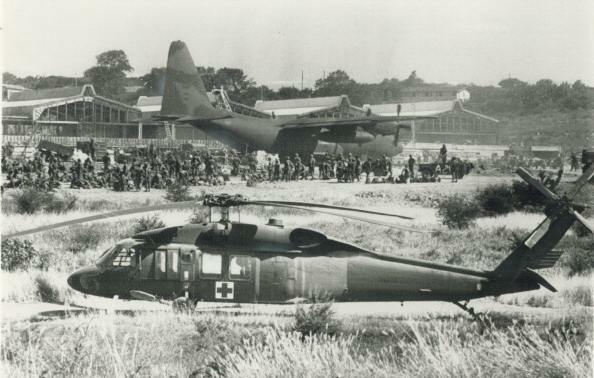 Under the pretext of protecting U.S. medical students on the island, President Reagan authorized the invasion. He felt justified in moving against a government that was using Cubans to build an airport and was a threat to U.S. hegemony in the Caribbean. At this turn of events, U.S. President Ronald Reagan dispatched a joint U.S.-Caribbean force to Grenada. 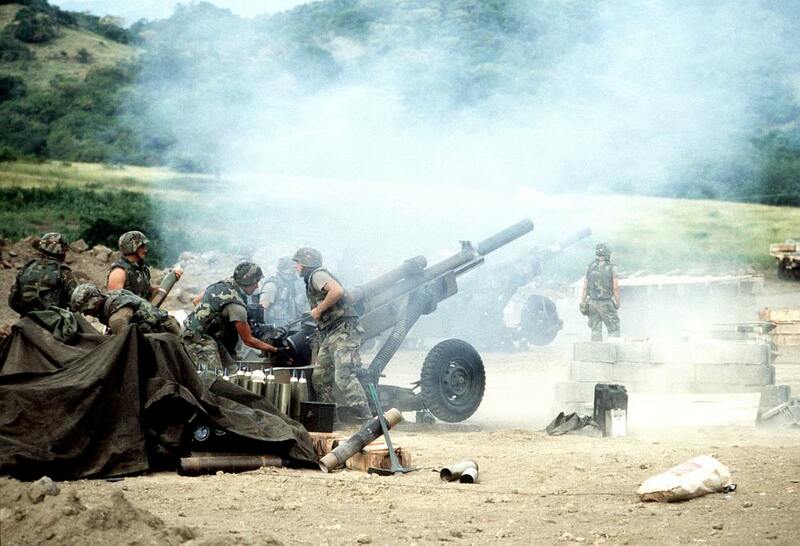 The Grenada intervention – operation Urgent Fury. The incident, known on the island as the “intervention,” continues to be a topic of discussion. 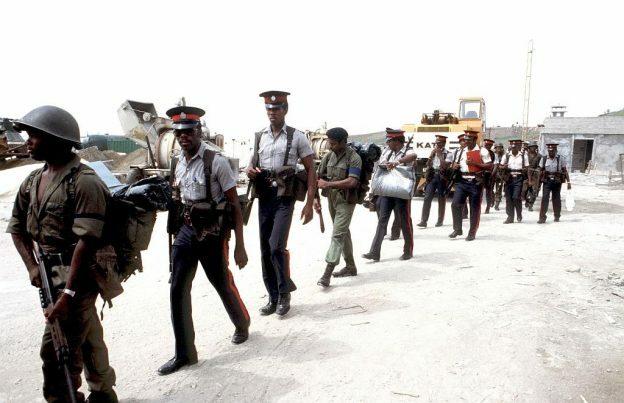 Leaders of the coup remain in jail on Grenada. In October 1983 the power struggle within the government had resulted in the arrest and subsequent murder of Bishop and several members of his cabinet by elements of the people’s revolutionary army. Following a breakdown in civil order, a U.S.-Caribbean force landed on Grenada on October 25. This was in response to an appeal from the governor general and to a request for assistance from the Organization of Eastern Caribbean States. U.S. citizens were evacuated, and order was restored. U.S. marines killed dozens of Grenadian soldiers and civilians and 18 Cuban construction workers. A client regime was quickly installed. They took control of the island, bringing an end to Grenada’s revolutionary government. One of the reasons given for the invasion was to rescue U.S. medical students who were studying in Grenada, though the leaders of the coup had reportedly offered them safe passage off the island. 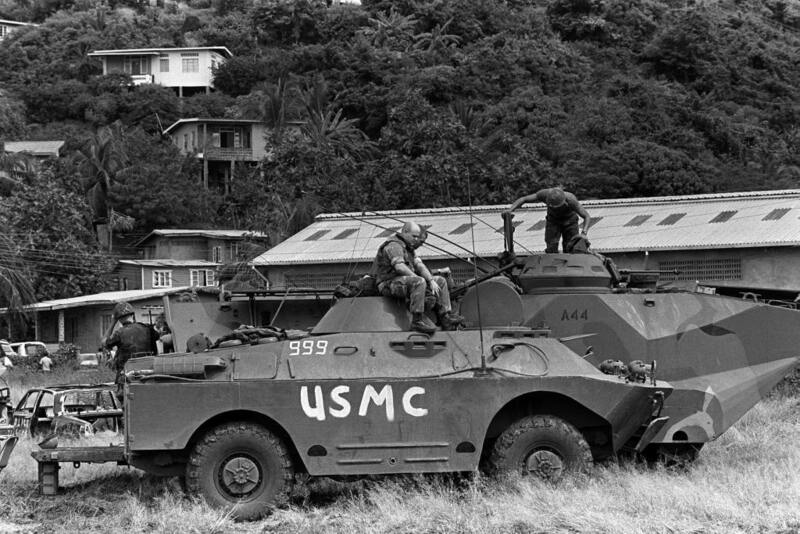 The Americans had plenty interest in breaking the Communist stronghold on Grenada. Read this analysis of the American motivations. 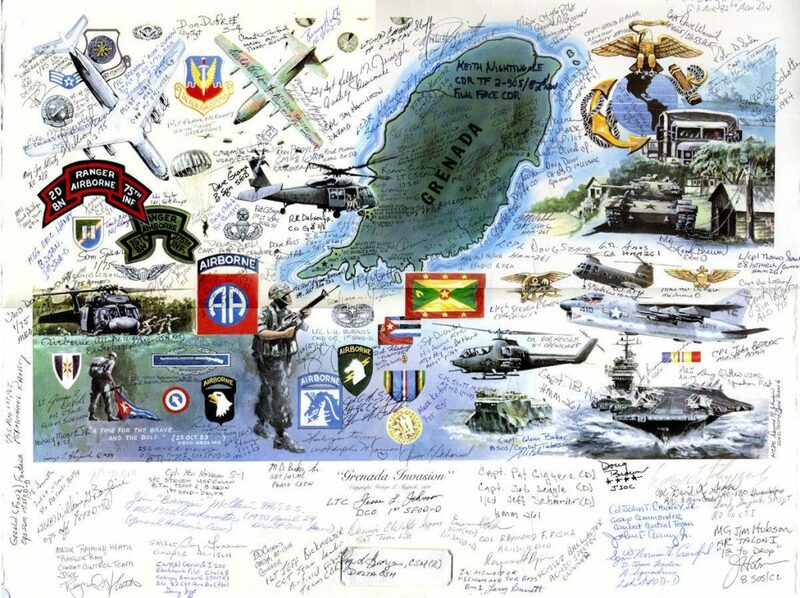 Collage of Grenada invasion airborne troups. Withdrawal of the U.S. troops and new elections. After U.S. troops withdrew, elections in 1984 installed the first of several postrevolutionary governments. Aid and technical assistance programs sponsored by the U.S. have strengthened the country’s economy. The leaders of the coup were put on trial in August 1986. Along with 13 others, Board was sentenced to death. This sentence was commuted to life-imprisonment in 1991. 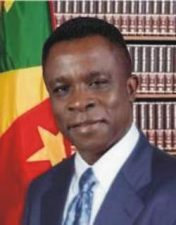 Prime Minister Dr. Keith Mitchell of Grenada is convinced that for Grenada to move forward it has to purge itself of the ghosts of the past – and among those is the freeing of the 17. Epilogue – Grenada after the revolution. The New National Party of Grenada – NNP. An advisory council, named by the governor general, administered the country until general elections were held in December 1984. The New National Party (NNP), led by Herbert Blaize, won 14 out of 15 seats in free and fair elections and formed a democratic government. Grenada’s constitution had been suspended in 1979 by the PRG, but it was restored after the 1984 elections. The NNP continued in power until 1989 but with a reduced majority. Five NNP parliamentary members-including two cabinet ministers-left the party in 1986-87 and formed the National Democratic Congress (NDC), which became the official opposition. Blaize breaks with the NNP. In August 1989, Prime Minister Blaize broke with the NNP to form another new party-The National Party (TNP)-from the ranks of the NNP. This split in the NNP resulted in the formation of a minority government until constitutionally scheduled elections in March 1990. 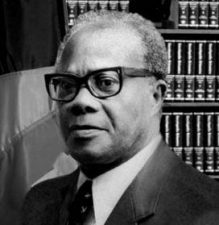 Prime Minister Blaize died in December 1989 and was succeeded as prime minister by Ben Jones until after the elections. P.M. Keith Mitchell of Grenada. The NDC emerged from the 1990 elections as the strongest party, winning seven of the 15 available seats. Nicholas Brathwaite added two TNP members and one member of the Grenada United Labor Party (GULP) to create a 10-seat majority coalition. The governor general appointed him to be prime minister. In parliamentary elections on June 20, 1995, the NNP won eight seats and formed a government headed by Dr. Keith Mitchell. source: U.S. State Department Background Notes 1998. Comments about the Grenada revolution. Documentation on film – producers of coverage during the Grenada revolution. Valerie van Isler, then WBAI’s international affairs director and later general manager, visited as well and coordinated frequent and thorough coverage of developments there. Bernard White, then a producer and now program director. Elombe Brath, then and now host of WBAI’s Afrikaleidoscope, also provided coverage, as did other reporters throughout Pacifica. Samori Marksman, the late, brilliant intellectual and WBAI producer who later became program director, traveled to the island twice. He brought back the voices of the revolution to New York, both on the air and in community forums. Maurice Bishop speech at Hunters College. Whenever NJM leaders came to New York, Marksman set up public events and radio interviews for them. He was a key organizer of the historic, standing-room-only forum at Hunter College in June 1983. Repeatedly broadcast on WBAI-at which Prime Minister Maurice Bishop made a memorable speech excoriating U.S. imperialist policies in the Caribbean. 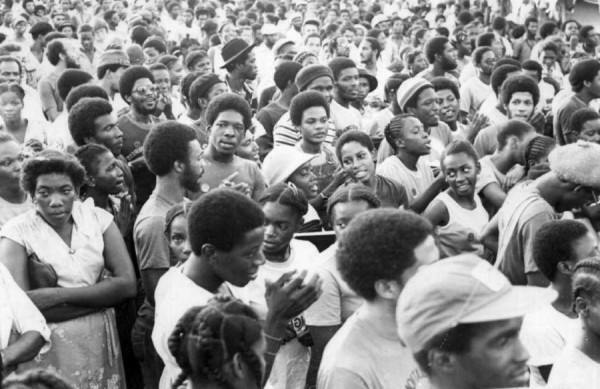 The political importance of radio was underscored at several critical moments during the Grenada events of 1979-83, from the seizing of the country’s radio station by NJM rebels on the morning of the insurrection, to the active use of radio during the revolution to educate and mobilize the masses, to the U.S. bombing of the station in the invasion’s first hours. And back in New York, WBAI was always there to tell the story to the world. Don Rojas, WBAI’s current general manager, was Bishop’s press secretary and the main liaison with community journalists. He was both a participant in and eyewitness to the tumultuous events of October 1983, which almost cost him his life. Historian Gordon Lewis reminded us after the invasion as follows. No examination of the Grenada Revolution should end on a pessimistic note. There is much to be proud of. Links about the Grenada revolution from March 13th of 1979. On the Grenada Government site. Remembering the revolution – A Bitter Anniversary. The country has attempted to increase tourism in recent years. A task made easier by the completion of the international airport in 1984. Previous: History of Grenada – from Prehistory to the Grenada revolution and beyond.